I dived into the rulebook and we set the game up from the Learn to Play book. There is a team variant specifically designed for four players, but we just played the two-player version with two players on each side deciding between us what we would do. This allowed all four of us to learn the game quickly, though for four players games we’ll be playing the Team version in future. We were the Imperials and controlled five systems at the start. The Rebels controlled two plus the Rebel Base. The aim of the game is quite simple. 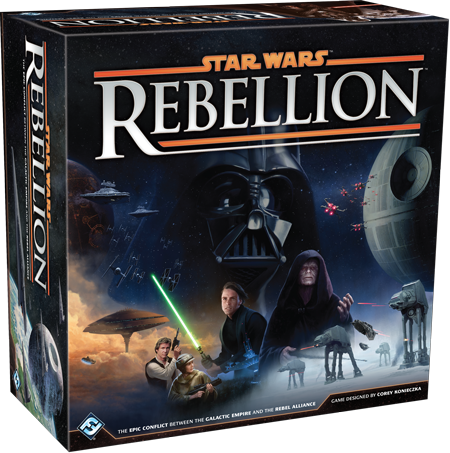 At the beginning the Rebels decide where their Secret Rebel Base will be, by secretly selecting a card from the Probe deck. The Imperials need to find the Base and destroy it before the timer runs out. At the start there are 14 turns in which to do this, but Rebel Objective cards can reduce the amount of time left in the game. For example, they have a card which says if they destroy a Star Destroyer, they can play the card to reduce the number of turns left by one. Another reduces the turns left by two if they destroy the Death Star! Both players start with four leaders and a number of mission cards. Leaders are the absolute heart of the game, they allow you to move units, perform missions, grant tactics cards in combat and can be used to oppose enemy missions. They have Mission symbols and tactical abilities for space and ground combat. At the start of the turn, in the Assignment Phase, first the Rebels then the Imperials play missions face down with one or two leaders on top of each one they play. You can decide how many missions you wish to attempt based on your leader abilities, but play too many and you won’t have Leaders to move units or oppose enemy missions. There are four basic mission types; Diplomacy, Logistics, Intel and Spec Ops. Leaders have a varying number of matching symbols which allow them to attempt these missions. So for example a mission that require 3 Spec Ops symbols can be attempted by one or two leaders with Spec Ops symbols totalling at least three. After all missions have been placed The Command Phase start. 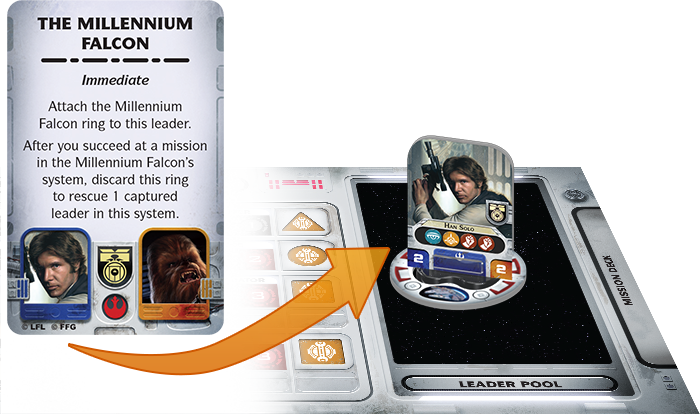 beginning with the Rebel player either a mission can be attempted, or a Leader placed on the board to move units. Movement is pretty simple, you place a leader and units in adjacent system can move there. There’s a requirement to carry ground units (and TIE fighters for the Imperials) with space ships, but it’s very simple to work out. If there are units of both sides in a space then there will be combat, first in space, then when that’s been resolved, on the ground. Each leader involved all its controller to draw tactical cards for space and ground combat. Dice are rolled for each unit attacking based on its abilities printed on the player sheet, so for example a Stormtrooper rolls one black die, an AT-AT rolls 1 black and two red dice. Tactical cards can be played to perform certain effects, typically increasing the number of hits or preventing blocking of damage. After which the defender can use tactical cards to prevent damage. Then the defender fires back. You can retreat and the battle continues till there’s only one side left. Combat is quick and elegant. I’ve played Forbidden Star several times and I always had a problem with the amount of time combat takes in that game. SW:R is much faster and smoother but still with great feel. If you choose to play a mission instead of moving, you reveal a mission and say where you wish to attempt it and place your leader on that system. If the opponent has a leader with matching symbols to the mission type available he can place that on the system to oppose you. You roll dice equal to the mission symbols on your participating leaders and the active player needs to roll higher than the defender. Missions are typically used to convert system so they become loyal to you, find special production cards so you can build Super Star Destroyers or Death Stars, capture enemy leaders, etc. It’s pretty exciting not having played before when your opponent plays a mission that you didn’t know existed, or you capture his best leader and prepare to freeze it in Carbonite! After all leaders have activated for missions or movement, or both players pass, there’s the Refresh Phase. Both players draw two more missions and the Imperial player draws two more cards from the Probe Droid deck therefore finding out two more planets they know the Secret Rebel Base is on. 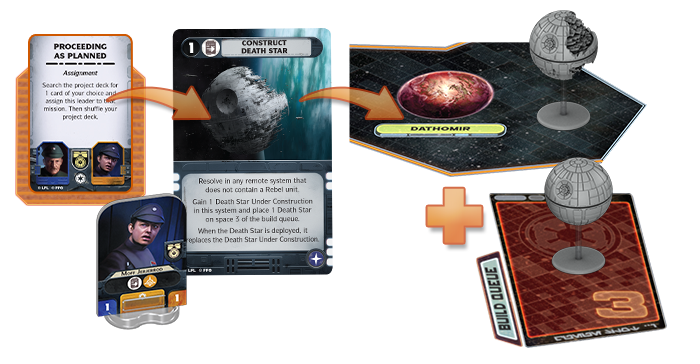 The Rebel draws an objective cards – for example Blowing up the Death Star! – and then the turn moves on to production. Depending on what turn it is you will be able to recruit extra leaders, buy units based on the systems you control – some units take up to three turns to make depending on the system used to create them, and deploy units. There’s plenty more to the game including sabotage, subjugation, action cards etc., and the game will be different every time. In the car on the way home we were chatting about strategy, should the Imperials just run around looking for the Rebel Base and not do many missions? If they do will the Rebels start stealing planets back off them and increasing their production? What’s the right kind of planets to take? Which leaders should I use for missions and which for movement? I can’t wait to play it again. Downsides? It’s a big game, you’ll need a full sized table to play it on. It’s really a two player game, and though the team game allows four players I think it might work better as just two, where you get to control everything on your side of the board. This is just a first impression review based on one play though so these ideas might change. I am very much looking forward to getting a lot of games of this in. Highly Recommended!